At the end of last year, Google announced it was officially pulling the plug on Allo, its latest in a long list of failed messaging apps. That list includes Google Wave, Google Plus, Google Buzz and, most recently, Google Hangouts (which has evolved into the enterprise-focused Hangouts Chat and Hangouts Meet). But while its consumer messaging strategy remains confusing, Google is making an aggressive two-pronged attack into the world of business messaging. As a result, it appears to be on a collision course with one of its big tech rivals. With these messages in Maps, you’ll never have to worry about accidentally sending “I love you, Mom” to that shoe store you’ve been sending messages to. Initially, businesses had to use their own devices’ messaging platforms to respond to customer inquiries. 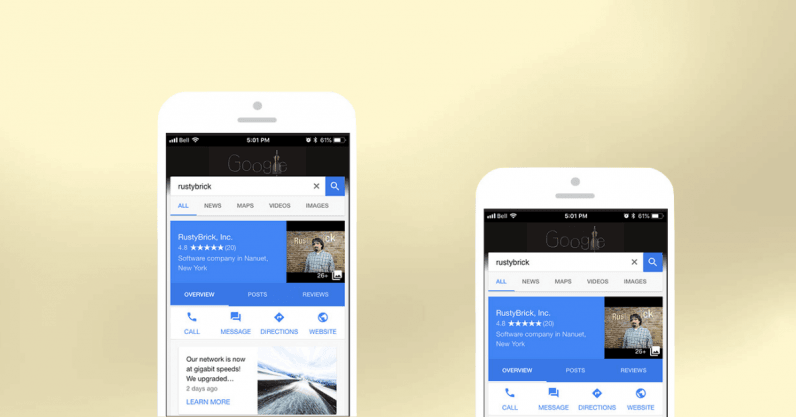 But in November, Google overhauled its Google My Business app, enabling small businesses to message customers directly from the platform. Banking its business messaging strategy on search — its undisputed strength — is a smart move on Google’s part. It also threatens Apple’s much-anticipated foray into the business messaging space. Apple began rolling out its Business Chat platform outside the US in October, enabling global brands and customers to interact via iMessage. Brands active on the platform, which is still in beta, include Four Seasons hotels, West Elm, and Burberry. To make things even more interesting, Google recently agreed to pay Apple $9 billion to to remain the default search engine in the iPhone’s Safari browser, according to one Goldman Sachs analyst. What happens when an Apple user discovers a business via Google and starts chatting? The conversation will open up in the iPhone’s Messages app but their messages will send via SMS instead of iMessage (iPhone people: that means green speech bubbles instead of blue), eliminating Apple’s ability to control the experience. In theory, Apple Business Chat still has a stronghold on Apple Maps. However, Google Maps is consistently among the top apps in the iTunes store — potentially robbing Business Chat of yet another key avenue of discovery. The Google My Business update is only one of Google’s business messaging plays that appears to be gaining momentum. The company’s failure to build its own standalone messaging app to rival the likes of iMessage, WhatsApp, and Facebook Messenger has led it to rally around the global effort to replace SMS with RCS as the universal text messaging standard. RCS, which stands for rich communication services, brings group chats, read receipts, typing indicators, branded business profiles, and other modern messaging features to old-fashioned texting. Many businesses still rely on SMS to send transactional messages like boarding passes, receipts, and shipping notifications to consumers. Global telcos, who have lost the lion’s share of consumer messaging traffic to the chat apps, are desperate to hold on to this share of the market, which is expected to be worth $70 billion by 2020, according to Zion Market Research. And it’s precisely this market that Facebook seems to be eyeing with its WhatsApp Business API, which launched in early access in August and is expected to become generally available next year. Google intends to make RCS the backbone of its native Chat app (Android’s answer to Apple’s Messages) but needs device manufacturers and global telcos to support the new standard. The Verge recently reported that Verizon will launch support for RCS messaging in “early 2019,” according to its SVP of consumer products. Verizon was one of the last major telco holdouts in the US, so this is a good sign for long-suffering RCS enthusiasts. A recent report predicts that more than 1 billion people across 168 global carriers will use RCS every month by the end of 2019, and that brands will spend more than $18 billion messaging consumers over the channel by 2023. Suddenly, RCS doesn’t seem like such a longshot. Google, meanwhile, may have finally found its messaging mojo.